Depart Geraldton for our 3.5 hour journey to the first group of islands, Southern Group. Start the day with a snorkel, dive or glass bottom boat over the crystal clear coral patches in the sanctuary. Take a tour to one of the Abrolhos pearl farms where there are 3 species of pearls including the black lipper oyster with the opportunity to purchase some exquisite Abrolhos pearls. There is an opportunity to try and catch one of the many fish that frequent the waters in our tender boat. Later in the day we travel north to the Easter Group and anchor inside the bay at Wooded Island for the night and try our hand catching squid or bait fish. Visit Wooded Islands sea bird nesting sanctuary and view the many varieties of birds that migrate from up to 7,000 nautical miles to nest on these islands. Snorkel in the protected squid hole or try and catch a squid for our chef to prepare for dinner. Fishing is optional. Visit Leos Island and feed the pet cod and check out the colony of sea lions on the island. Cruise on to the anemone lump for a dive, snorkel or glass bottom boat ride and hand feed the fish in the sanctuary. Depart for Wallaby group and anchor inside the lagoon - Island of the Angry Ghosts - Batavia's graveyard - night fishing is an option. Watch the Batavia movie ready for the tour tomorrow. Tour the Island of Angry Ghosts and relive the biggest Australian maritime history. Dive, snorkel or glass bottom boat over the Batavia wreck site if conditions are favourable. Take a tour on to Big Pigeon Island and hear the history of the crayfishing industry or visit Wiebbe Hayes fort, the oldest structure in Australia. Weather pending either stay the night in Turtle Bay or head north. This morning we set sail for the Shark Bay World Heritage region. Travel time 20 hours. Spend the day beach walking, snorkelling, fishing or exploring Dirk Hartog Island and surrounding islands. Learn about the first European, William Dampier, to set foot on Australian soil 400 years previous and maybe visit the very spot - Cape Inscription. There is also the opportunity to go fishing or snorkelling. 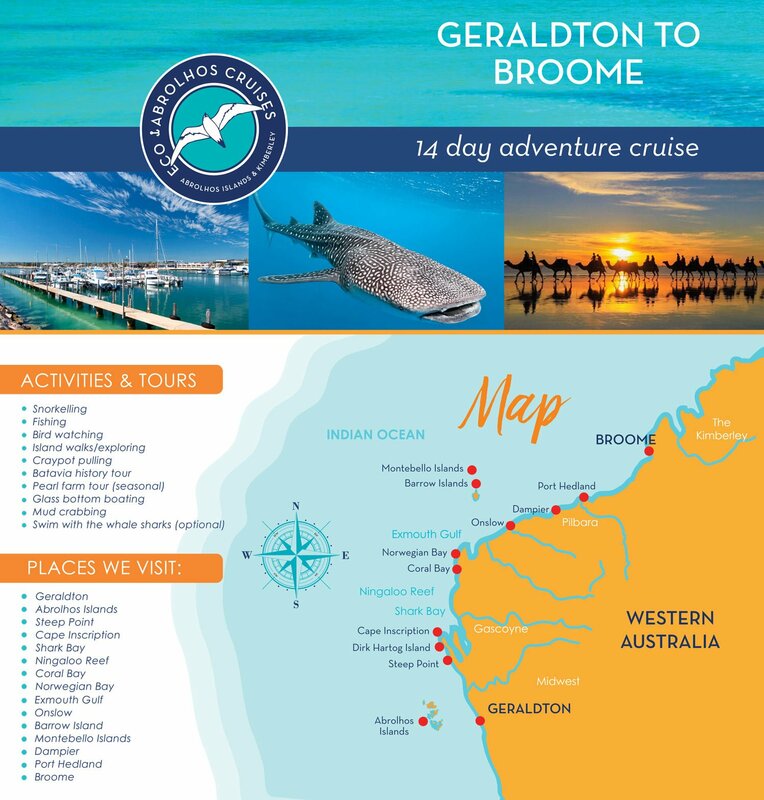 Today we are cruising the Ningaloo Reef trying to spot the gentle giants of the ocean, the whale sharks. We also have the opportunity today to fish, snorkel, dive or glass bottom boat rides. We will drop anchor on Coral Bay and if time permits go ashore. A relaxing day on one of the many islands outside Exmouth Gulf. A day to chill out and watch the world go by. Today we also have the opportunity to dive, snorkel, fish or glass bottom boat rides. Pull into Beadon Creek at Onslow and from here we can take a bus tour to the $40 billion Wheatstone LNG Gas project which is 20 miles south of Onslow. Visit Tune-town which has a redundant fuel tank which was used in the second World War to service the RAAF who operated from Onslow when the Japanese were bombing the area. This tank is nothing like you have ever seen before. we guarantee your favourite cartoon character painted on the walls of this tank. This is an icon in Onslow. Whilst in Beadon Creek it is a good time to visit some of the northern creeks in tenders as the mud crabs are prolific in the area. Tides have a bearing on this activity. Cruise to the Montebello Islands by-passing Barrow Island on the way which is the site of the $57 billion Gorgon LNG Gas Project. Depending on our progress we could stop into the south end of Barrow Island where there is good anchorage with fishing, snorkelling and diving. We can hand fee the leopard sharks at night. Explore the Montebello Islands, the ruins of nuclear testing from the 50's and learn a little history. This is also turtle central, so while we are here it's an opportunity to see these great creatures laying eggs and hopefully see some hatching. Travel to Dampier Archipelago with many islands. Dampier is a very busy port servicing oil and gas sectors as well as the massive iron ore industry. Watch the many ships and rig tenders on the move as we bypass Dampier and cruise past the many neighbouring islands. Pull into a little known area inside Westmoore Island 60 kilometres past Point Samspon, Balla Balla Island and Anketell are close by as well. This is the spot several high grade iron ore mines and port facility are earmarked to be built. The creeks in this area are extensive so a good time to re-set the mud crab nets and to fish. Time to finish the voyage with a relaxing cruise through to Broome via Port Hedland which is the busiest port in Australia. We bypass many ships on anchor waiting to load iron ore from this port. Broome, the melting pot of many cultures, which makes this town unique. Sadly we say goodbye, but we leave with new friendships and the promise of more adventures, after the trip of a lifetime. Prices include GST, tours and meals. We do provide fishing gear, there will be a one off fishing charge of $20 pp if you participate in fishing during the cruise. The following is all included in the price of your cruise. Alcohol (We have a licensed bar open from 10am till midnight, drinks will be charged to your room. Strictly no BYO. Soft Drink, bottled water and expresso coffees are available at the Batavia bar all day. Closed in shoes for walks. (Will possibly get wet).